I started my trip off with this bar from gnu Foods. 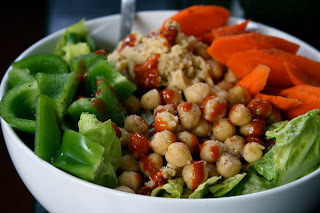 Well, I actually started it with a huge salad that looked like this, but out of a tupperware...I know fancy! My friend, Laura, passed the bar on to the illustrator at another convention in exchange for a Macro Bar he had (more on those later). She told him that she believes the world would be a much happier place if people put more fiber in their diets. I would have to agree! This may not look so great, but I thought is was so good! The texture was perfect. 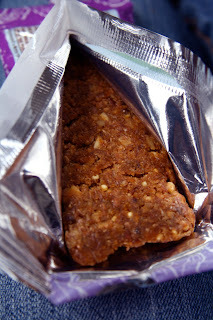 It had a nice cookie texture with the perfect amount of sweetness. The raisins and cinnamon were obviously a great combination...I only wish I had a cup of coffee to go with it. Unfortunately, we had just left Starbucks...where I did not think I needed anything! Oh well, water goes well with everything! As I was eating my bar, we passed the peach in Gaffney, SC! 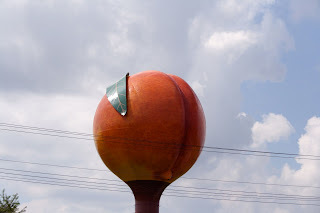 I always looked for this as a kid going to my grandmother's house. It was a marker for me then and I still love passing it now! It makes me giggle! 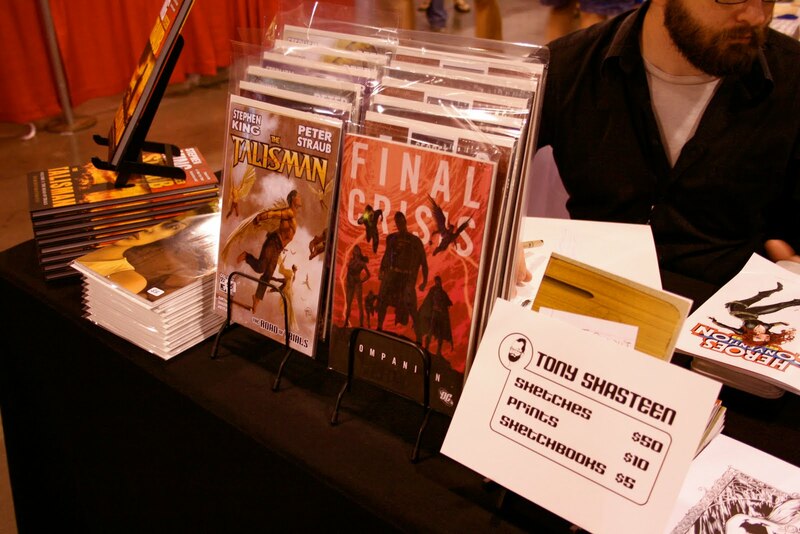 So, if you have never been to a comics convention...this is what it looks like, well from our prospective anyway. Have you seen Chasing Amy? Well, that is dead on for comic conventions! We go to the conventions to promote the illustrator's work and to meet new contacts. Illustration is a dying industry and comics is where it is at! This convention in particular is like a class reunion for us. Since it is close to our home, we go every year, work all day and play all night! 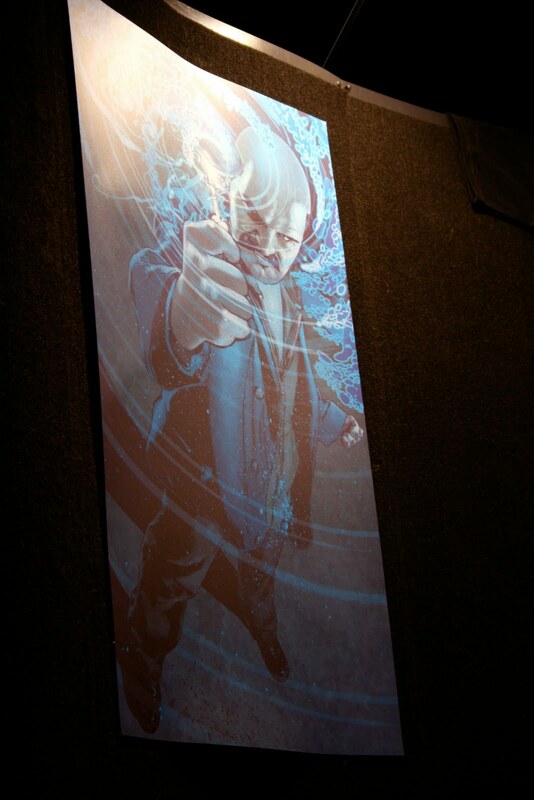 This is an illustration from The Talisman that we printed for the backdrop. 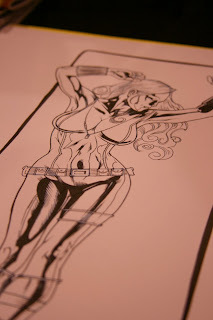 The illustrator does commissions while he is there. He did quite a few, but I really liked this one. This is Black Widow. I am not a good comic illustrator's wife...I don't know much about comics. I know enough to get me by, but that is really not a lot! Sometimes you just don't want to talk about food. So, I chose to talk about my favorite person today. I think it is because tomorrow is our 15 year wedding anniversary! No, we are not old...we just got married really young. I just knew he was the one! I think I may even share some pictures of that tomorrow! For now, I am off to make chicken pot, chicken pot, chicken pot pie! A Very Happy 15th Anniversary to you and Tony! Hope you get to spend a wonderful day together! Happy Anniversary to yall!! :) Have I told you that my husband Andrew is also an artist? He is obsessed with comics!! Nice, I didn't think anything could distract me from Bacon but you said the magic word! Pot PIE! Fun post, and sounds like it's perfect timing! You're right, doesn't always need to be about food - it was fun to take a peek into your lives. Your husband is so talented! And I think your closeness in work sounds lovely. Also - that salad looks picture perfect, and I LOVEE the cinnamon raisin gnu bar :) Don't they have the best texture?! I like when people talk about other things than food. It's boring to read: I ate this, this, and this. Your husband sounds like a very cool guy. I wouldn't expect anything less since you're pretty rad yourself! Your husband is quite talented. 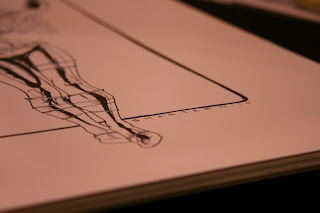 I knew he was an illustrator, but I had no idea - wow, I'm impressed! 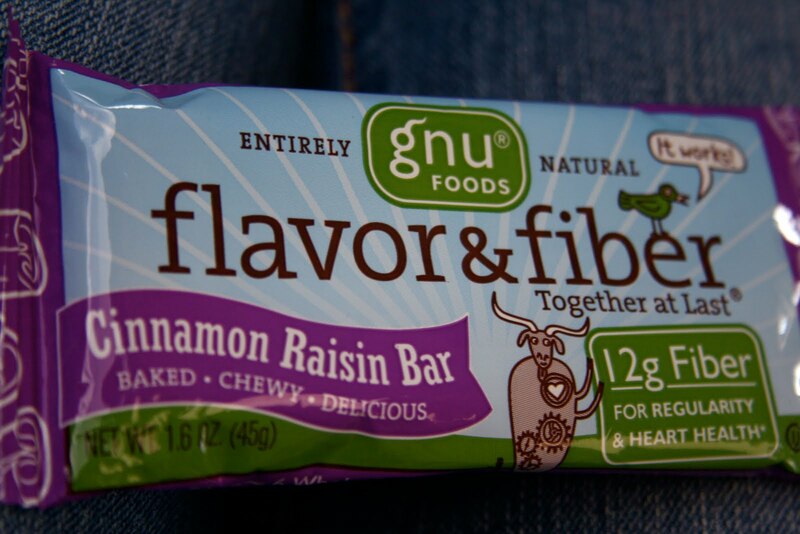 Glad you liked the Gnu bar - loving on some fiber myself these days. 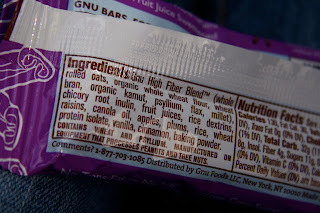 I'll have to try that flavor as I wasn't too impressed with the chocolate. Oh my gosh he does great work! Awesome! Hubs and I both work from home and both have a lot of the same interests that we do together. A lot of people wonder how we can spend so much time together and I wonder how they think it's hard.